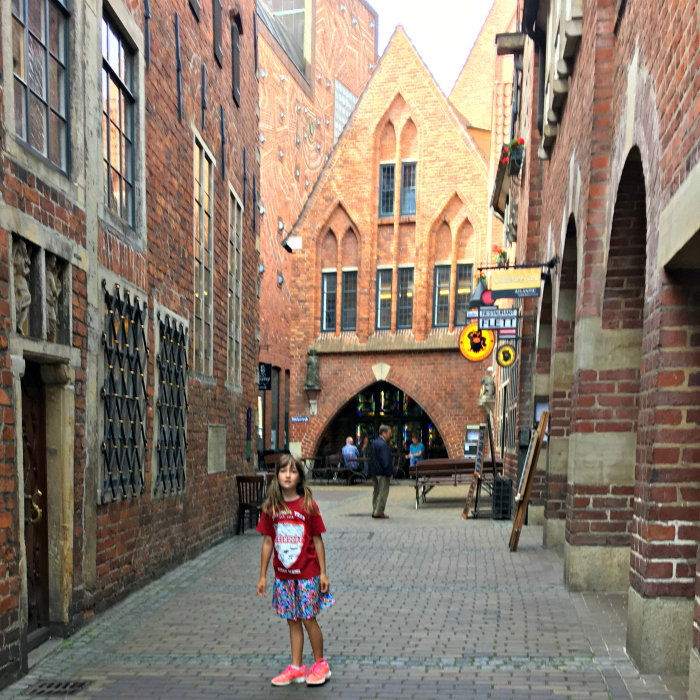 We started our trip by spending a few days in Bremen, a birth place of my husband. It was great to see my father-in-law again and enjoy a familiar European daily rhythm of a light breakfast, a hearty lunch, and a dinner of bread and meat. Maybe this habit of not eating a big dinner explains why Europeans are not as overweight. Smarty was mostly interested in parks and playgrounds, but she joined us on an outing to a town center with its medieval streets and churches. She was very determined to keep shopping and sightseeing to a minimum, especially since she had visited Bremen many times before when she traveled with her Dad. On Friday, we left Bremen and drove to Wolfenbüttel, a town in Lower Saxony, and a new home of our good friends who used to leave in US, but chose to go back to Germany about 8 years ago. Our friend is a teacher of English and history at a gymnasium school, and her three girls all speak fluent English. Smarty was eagerly looking forward to her time with her friends - they only get to meet once a year when she visits. Wolfenbüttel is a lovely town that apparently has the largest collection of timber-framed buildings in Germany. Our friends, however, leave in a comfortable and modern house that they had custom built for their family. 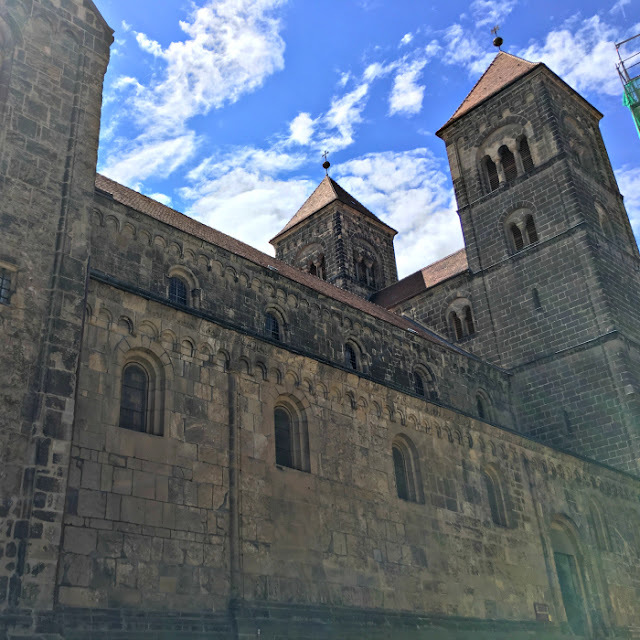 Of course, Germany is famous for its castles, and we did get to see one - our friends took us on a day trip to Quedlingburg, about an hour away from them. It's hard to imagine, but the castle in this picture started its existence (not in its present form, I think) 1000 years ago and was built by king Henry I. The castle, the church and the entire old town are on UNESCO World Heritage list. However, the girls were not at all awed by the history of the place. They were a lot more pleased with a local playground and a lunch of waffles and pancakes. Our friends graciously offered to host Smarty for three days while we went off on a "mini-vacation for adults" to Berlin. I really wanted to visit it, because it was the last major capital of Europe that I have never been to, and I always wanted to see a famous Nefertiti bust in Pergamon Museum. 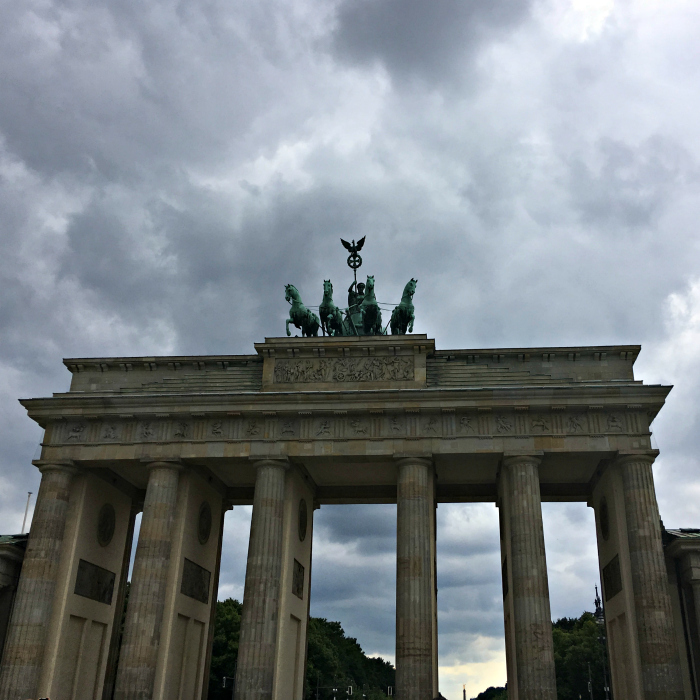 Now I can cross this off my "bucket list" :) In three days we visited 7 museums and walked busy streets of central Berlin many times. 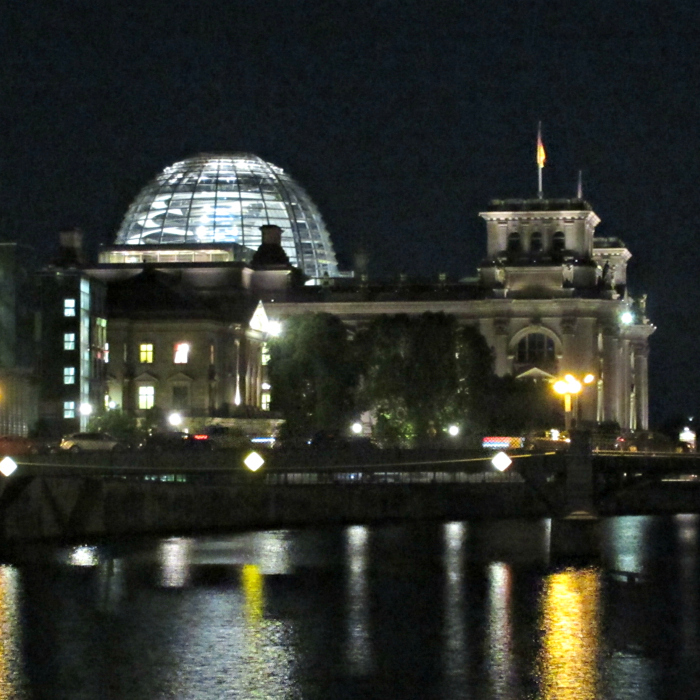 Smarty would not have appreciated any of this - right now she is only interested in the museums where she can interact with exhibits, so the only museum that she might have enjoyed was a pretty amazing DDR museum. Our current thought is to revisit Berlin in 2020 when our daughter might be a bit more interested in history and art than she is now. 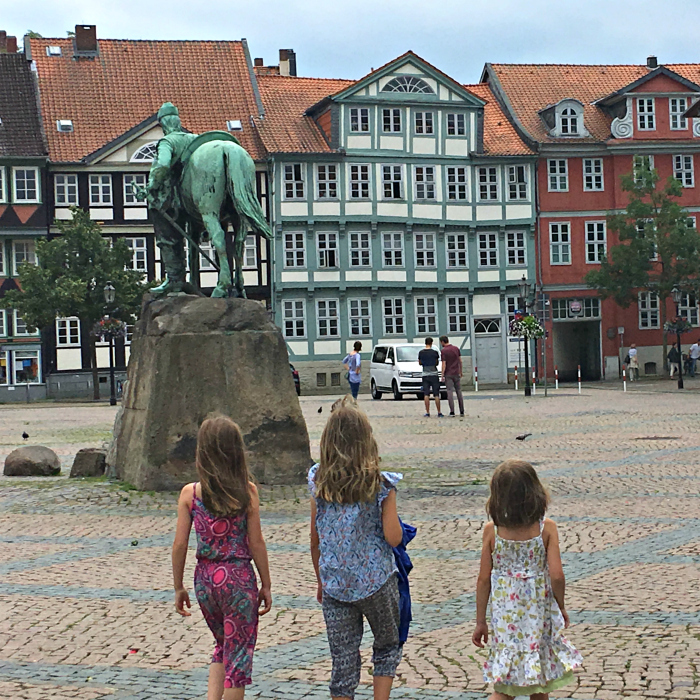 We picked up Smarty (who really did not want to leave her friends) and headed out south to Cologne to spend a few days with my husband's brother. 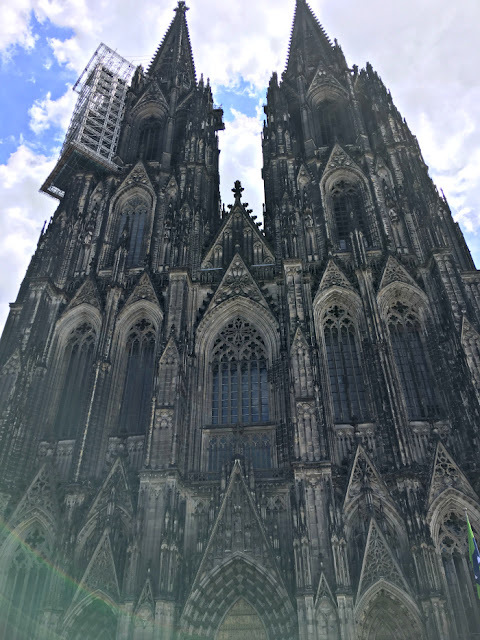 The first day in Cologne was as gloomy and rainy as the whole week that we spent there with baby Smarty, but we were rewarded with blue skies and pleasant weather on the day we planned to go to the town center. Again, it was all "old hat" to Smarty, even a famous Cologne Cathedral, but she did enjoy a guided tour of Fragrance Museum where we learned a lot of interesting tidbits about perfume making and history of famous Eau de Cologne. 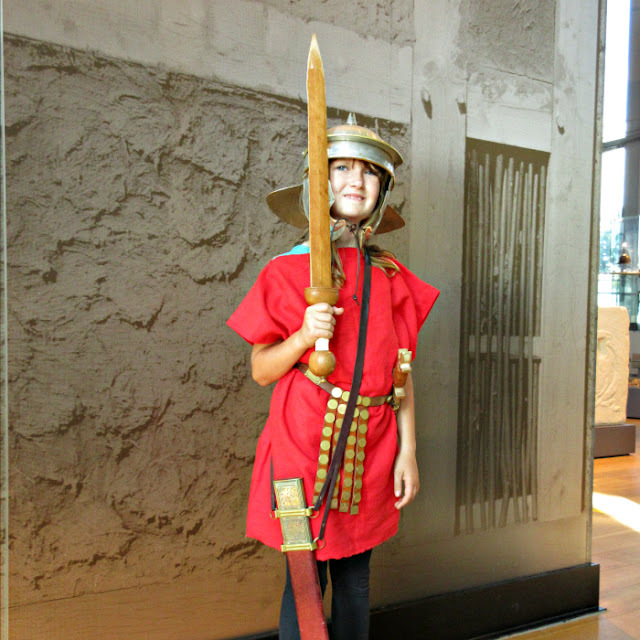 We thought that Smarty would enjoy a visit to an even more remote past, and we went on a trip to Xanten archaeological park. Xanten was a major colony on the eastern frontier of the Roman Empire, and it is a preserved area where some buildings have been reconstructed to give us an idea how life might have looked in the age of late Roman Empire. The whole complex was very interesting, but Smarty was in a grumpy mood most of the time, because there was nothing to do, just to see. She did cheer up a little when she had a chance to dress up as a Roman soldier at the museum, but I was glad that we got to the museum only shortly before its closure, because she was about to "lose it". Our last stop was Bremen again where we celebrated my father-in-law's 87th birthday. As a present, his sons arranged a tour of Bremen Ratskeller - one of the oldest wine cellars in Germany, built in 1405. We all got to see the oldest (drinkable) wine barrel in Germany - the wine in this barrel is dated 1653, quite before the American Revolution took place. 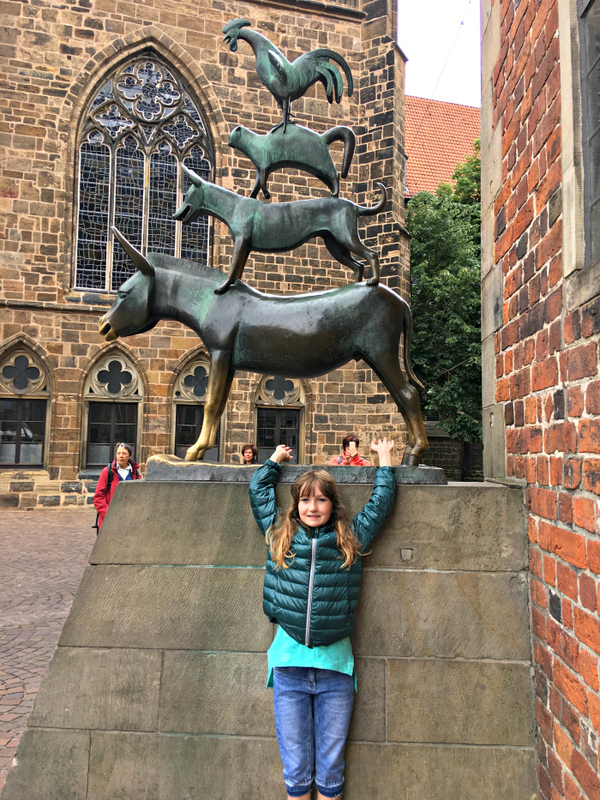 The place was quite fascinating, but, since the tour was in German, both Smarty and I were quite bored in the end and happy to go back to sunshine and to a famous statue of Bremen Town Musicians from Brother Grimm's fairy tale. How Is Germany Different from US? A lot more people of all ages are riding bikes - not just for exercise, but to go about their daily business. Bike racks are everywhere, there are bike lanes, and bikers don't need to wear helmets. A lot more people are using public transportation to get places. Recycling is taking a lot more seriously, with meticulous separation of paper, plastic, compostable materials, and plain garbage. Main meal is happening at midday, not in the evening. Most people of all ages speak a second language, usually English. Kids start learning English either in the third grade at the very latest, usually earlier. Playgrounds are more "fun", there seems to be less concern with everyone being "bullet-proof safe" and more reliance on common sense and/or parental supervision. Your trip sounds great. I remember a summer I spent doing research on church organs in Germany when it was cold and rainy the entire time. Sounds like a wonderful place to visit. I like her observations. I love places where you can walk/bike everywhere. Germany sounds like a cool place to visit. I'd agree with her on the playgrounds. The public transportation probably has a lot to do with how the cities are built. Here in my part of Texas, the city is so spread out, it'd be hard to design public transportation.